I have completed quite a large number of trades for CMFs on here, probably at least 60 now. I've noticed that the ones I get sent are often sent as parcels rather than large letters, thus cost significantly more to post for the sender. So I thought I'd share what I do when I pack them. I know some people do exactly what I do as I often receive them packed like this too, and I learnt this from someone I traded with. I cannot remember who it was, it was so long ago. And in case anyone thinks I am a tightwad - I am, so that's out of the way. Anyway, the reason for this is that a large letter (up to 100g) costs 90p to send first class, a packet (up to 750g) costs £2.70. Second class, the prices are 69p and £2.20. I don't know about postage limits in other countries, but you might be able to adapt it if you have large letters vs parcels too. If you are sending six minifigs, then they are normally under 100g, so it is clearly better to send them as large letter. What I normally do is tape each packet closed, or put them in a small bag. It's best to keep it as small as possible (or pack it and fold it and tape it) so that the pieces don't move around to much. The trick is that you then tape the packets together side by side or tape them to a piece of paper next to each other. When they go inside a jiffy bag, this ensures that they do not shift about and so the envelope does not become any fatter if it is shaken / dropped / held upright as the packs don't all end up at one end. If the envelope is under 25mm and fits into the postal guide for large letters it qualifies for large letter rate rather than parcel rate. If the minifig has a large utensil / headgear (Aztec!) then it is often an idea to remove this from the packet and bag it separately (again taped to neighbouring packs or the piece of paper), and I sometimes remove the black plates too and bag them separately, or stack them. Capes usually go inside the leaflet, or get packed against a piece of card, so they do not get crushed when you tape the packet closed, especially if you fold the top down. This all helps keep the width of the packet down. If you can keep it to under an inch, you will save money. Especially if you are only trading a few minifigs, the saving can be £1.50 or £1.80. If you do a few trades per week, this soon mounts up so is worthwhile trying it out. I find it takes virtually no time to do. I nearly always post mine from a post office, so you can quickly check if it fits though the guide, and get proof of posting at the same time. If anything goes wrong I'd always refund the other trader the Royal Mail fees for getting the postage wrong - but it never has so far. Plus you have proof that the Post Office checked it fit through the guide, since they gave you a proof of posting when they took it. I also recycle jiffy bags - often ones from lego. Again, it's nothing original and I know other people do this, since some that I have received I can trace to at least three previous bricksetters by the address labels! One once started with me (reused from a lego PAB online order), got sent to two other bricksetters and got returned to me in another trade. And if you use bricklink, chances are you have loads of small resealable bags. I hope this helps someone save a little bit of cash. They way I think about it - every time you do it, you can afford another CMF. Interesting read. I'm starting to think about dabbling in a light bit of re-selling and one thing I am wondering about is how to send / insure stuff. Where would people normally set the limit for what would go normal post and where would you start sending it requiring signature on delivery (with insurance, etc) ? ^ In the UK, we have proof of posting which is meant to get you compensation if a parcel goes missing, up to £40 or so. I normally rely on it for anything up to £20. That said, I think I have used it once in about three years. Above that, I'd use recorded delivery which gets you a signature. Especially for ebay sales paid by paypal where some rouge buyers can claim never to have received something. Sometimes for bricklink sales too, depending on the buyer's feedback. For trades on here, I've found people are more trustworthy and never found the need to use recorded delivery, although the most I have ever sent in one go is about £100 worth. Again, UK only, but collectplus is useful if you are trading larger sets and you want to minimise costs. It can cost as low as £3.50 / £5.00 depending on whether you post to a local store so the person can collect it or to someone's house. Here in the us the letter can not be thicker then 1/4. Sending it without any packing material "might" make it under 1/4 but I would not want my tradee being disappointed I. Getting a broken minifig or piece. Worth a bit more to ensure safe deliver. Yes, I think RM are quite generous as we get a full inch thickness for our letters (well, 25mm). The issue in the US is that if you post it as a letter instead of a parcel it goes through the sorting machine which is why there is a thickness limitation. I never send lego as a letter due to possibility of damages. What @CCC says is clearly good for UK and perhaps the rest of Europe, but I would advise against mailing any Lego as a letter. I've mailed a few cheap replacement plates, tiles, and one 1x1 brick as letters, but for anything significant I use a bubble mailer and print the shipping label. Postage is fairly cheap and cones with tracking. Letters in the use are machine-sorted as @graphite mentioned, and if it's too thick it will jam the machine, probably be torn, and smashed from the weight of the mail piling up behind it. I'll see if I can find a picture somebody posted recently of what can happen. Eh, can't save and attach photos from the ol' iPad so here's the link with photos. A jiffy bag is a bubble mailer. Slight tangent: the excellent Yellow Farm Bricks on bricklink managed to get a rather sizeable order for me into a 'large letter' size box: it was just under 25mm thick, and IIRC about 18x25cm. The parts were sorted into several little press-seal bags and then taped to the bottom of the box so that nothing shifted round too much and whatever way up the box was left in transit, it stayed slim enough. I have since done the same for a couple of unboxed smallish (£10-15) sets by recycling mrs j's old 'graze boxes' and contact lens boxes (also made the shape they are for the 'large letter' size). ^You need to be careful with the graze boxes, they're very thin and easily bulge making them bigger than the large letter size. I've used them too but there are though plenty of proper boxes made to exactly fit large letter. I have done the same as @CCC when posting BL orders out. I pack the bricks as slim as possible and tape them to a sheet of card from the recycling bin. The important thing is to make sure the contents cannot move and make the thickness more than 25mm or it can and will get surcharged by the Royal Mail. I started with Jiffy Bags bought from Poundland or the 99p stores at 7 for a £1, but have now got a supply of DVD mailers, which are excellent for posting out lego. I lay the bricks out in their bags and fold the mailer over tightly before taping it up which makes the package slim enough most times to get the large letter rate. Another worthwhile investment is a Pricing in Proportion Ruler - I paid £5.50 from the local post office, but I note they are listed on Amazon for various prices. This has the slot which your packet must pass through. You will soon get the money back from postage saved, and can argue with some certainty when the PO bod tries to charge for the packet rate - been there done that! I always get a proof of posting, which covers up to £46 if the package gets lost. 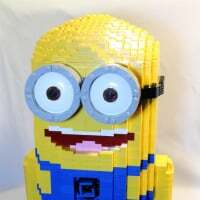 ^ cant you make one out of lego? ?